Elegant and dramatic, these Victorian dangle earrings have the perfect blend of Old World romance and edgy sophistication. Scalloped buttercup mountings, edged in black enamel, showcase rose cut diamond centers. 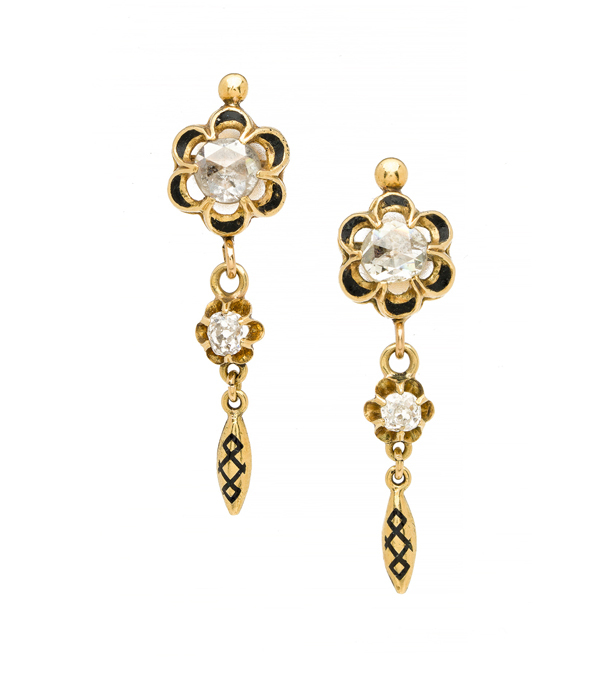 Dangling old mine cut diamonds in smaller buttercups, and smooth gold finials, also detailed with the tiniest black enamel accents, add a dramatic touch to these beautiful vintage earrings. Add a cool, glamorous accent to any evening affair or pair these earrings with your softest cashmere sweater for a lived-in luxurious look. These are one pair of antique earrings that will never go out of style!